Women’s GAP Denim Jacket XL. Shipped with USPS Priority Mail. GAP Women’s Denim Jacket. Condition is Pre-owned. Shipped with USPS Priority Mail. Perfect condition! Worn only a handful of times. Excellent for layering. Length: 28". Wool blend with full twill lining. Black: 48% Polyester, 41% Wool, 7% Nylon, 4% Other Fibers. Fit & Sizing. Machine wash. Straight silhouette with a relaxed fit. Functional swean pocket at front. Condition is pre-owned but excellent. Actual sizes: Lenght from nape of neck to bottom hem is 21". Around the chest (below the arms) is 34". GAP Open Front Full Length Denim Jacket. Condition is Pre-owned. Shipped with USPS Priority Mail. 60% Polyester, 40% Wool. Fit & Sizing. fabric & care. Flap pockets. Double-breasted button front. BUTTON DOWN. ACROSS BOTTOM 42". LENGTH-23". UNDERARM TO WRIST-19". Not doubled. Length - 27". 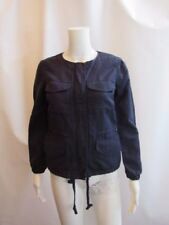 Pre owner Gap Denim Jean Jacket Trucker Women's XL 99% Cotton/ 1% Lycra Spandex. Condition is Pre-owned. Shipped with USPS Priority Mail. White Gap Jean Jacket Sz XL. Condition is Pre-owned. If there is a problem, we can work together to resolve the problem. We will make every attempt possible to resolve the issue if we made a mistake. (It happens). Let us know if our service could be better! All buttons have Logo.6 buttons closed front. Long sleeve closed 1 button. 2 pockets on chest closed 1 button.2 pocket on bottom in seem.Chest 44" around under armpits. Length 26". Length sleeve from armpit to bottom 18". 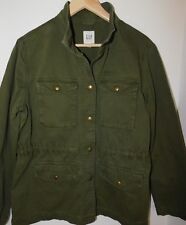 Gap Stretch Olive Green Blazer/Army Button Down Jacket. Features buttons on the back of sleeves at hem and pockets with buttons on sides. Sleeve length: 23". 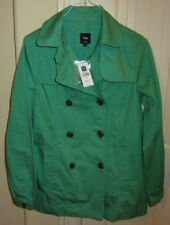 Gap Women's Classic Belted Trench Coat 100% Cotton Fully Lined Light White. Condition is Pre-owned. Shipped with USPS Priority Mail. Across chest lying flat: 19”. Across waist lying flat: 18”. 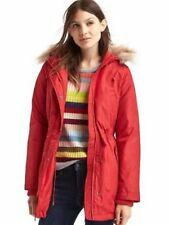 Gap Down Puffer Coat Jacket Black Womens Size Medium. Condition is Pre-owned. Shipped with USPS Priority Mail. Model is wearing a regular Gap size S. 55% Wool, 25% Polyester, 20% Viscose Rayon. Fit & Sizing. Machine wash. Straight silhouette with a relaxed fit. product details. Front welt pockets. Double-breasted button front. Gap woman’s rain utility jacket size xl navy blue Button/zip Up Hoodie. Condition is Pre-owned. Shipped with USPS Priority Mail. I take the best pictures I can and describe the best way I can. I am happy to make things right! 2% Spandex. 32% Viscose. 66% Polyester. Condition: near excellent, I did have to replace a few buttons and there not an exact match but very close This garment is from the 2002 collection. Denim material is also a very think sturdy jean material. Features: button front, 4 button closure pockets, waist tie, button sleeve cuffs. Size:. Medium Shoulders:16.5 Arm:33 Sleeve:24.75 Chest:18.5 Length:41.5 ** Measurements are taken in inches and across only(unless stated otherwise). ** For measurements around double necessary above measurements. 3 business day processing (No shipping on Saturday, Sunday, and holidays) Returns accepted within 14 days. Buyer pays return shipping. Womens XS vest down puffer grey fur collar gap wool RN54023 . Shipped with USPS Priority Mail. Sleeveless, Button Front. Adjustable Waistline. Shell, and Lining made of 100% Nylon, Filler 100% Polyester. Excellent Condition. 1 Spare Button. Preowned Women's Black Denim Jacket from the Gap. Size 8. Nice shape, see photos for condition and measurements. Shipped with USPS Priority Mail. GAP FADED BLACK DENIM JEAN JACKET. LIGHTLY USED & VERY CLEAN. EUC Womens Gap Denim Moto Jacket XXL. Condition is Pre-owned, worn only a couple times. No flaws. Large interior pockets. Side zip exterior pockets. Zip cuffs. Shipped from my smoke-free home with USPS Priority Mail. Gap Eyelet Jacket, sz S Small -White. Condition is Pre-owned. Shipped with USPS Parcel Select Ground. The perfect distressed jean jacket! Material: 100% Cotton. Sleeve Length: 17in. (pit to the end of sleeve). Length: 19in. New with tag Gap quilted jacket size small. The jacket is in excellent condition. Measurements: 22 inches from the top of the jacket to the bottom of the jacket, 17 inches from armpit to armpit and an 18 inch insleeve. Make Supersized seem small. Get images that. Usually a lot sooner. I do my best to get everything out as quickly as possible. Gap 1969 Blue Jean Jacket Women's size L. Condition is Pre-owned. Shipped with USPS Priority Mail. This is a light-weighted vest with a polyester filler. Could be used year round. Zip front with 2 snap front pockets. In the 6th picture, you will see a "flap" in the back which opens to 4" for your comfort in sitting or bending. Gap 1969 Denim jacket. There are slight discolorations, pictured in the photos. GAP Leather Jacket Women’s Small. Shipped with USPS Priority Mail. Gap Women’s Size Small Pink Fleece Hoodie Jacket! Good Condition!